Teen Marine tackles terrorists in Deborah Curtin’s action-packed novel honoring troops, showing new dangers to USA. “They're carrying out sporadic terror attacks on police, have threatened attacks on government buildings and reject government authority,” the Department of Homeland Security recently warned in an assessment on terrorist threats within the United States. Along with US residents seeking to join the ISIS terror group, the danger is very real, as Deborah Curtin depicts in her novel, “Today is the Day” (published by Xlibris). The story follows Pete Alexander, an average teenager whose life is turned upside down when his best friend dies in a car crash. His recovery is aided by their neighbor who introduces him to the short wave radio, and with it he overhears a terrorist plot hatched by unknown assailants. To protect those dear to him, he joins the Marines and in the ensuing conflict, Curtin juxtaposes the strong military theme with her Christian values, portraying Pete as a man who meets the devil and rises to the challenge. By embracing each day with perseverance and fortitude that guides him right through to the end, his example is designed to inspire readers to face life in the same manner. Curtin highlights the post-9/11 realities facing the nation and the Christian values driving Pete as he embarks on a modern day hero’s journey by becoming one of the few and the proud safeguarding America. Curtin draws from her family’s military heritage to honor those in the front lines, the brave servicemen and women who defend freedom and who sometimes have to make the ultimate sacrifice, as well as the loved ones they leave behind. 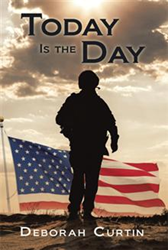 “Today is the Day” will engulf readers with its steady build up of conflict and intrigue them with the protagonist’s growing maturity while letting them examine the workings of the minds of America’s valiant defenders. Deborah Curtin is a creative artist and writer. Having the opportunity to write for a local newspaper allowed Curtin to hone skills of research needed to engage the reader as she worked on a current story, all the while keeping it entertaining and engaging. She currently writes for an online publication, The Londonderry News NH. She is a member of the New Hampshire Writer’s Project which offers support and many opportunities toward the excellence of writing.